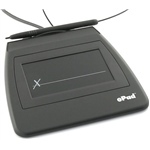 ePadLink provides the popular ePad electronic signature pad series. Capture, manage, and store electronic signatures to save time and resources. 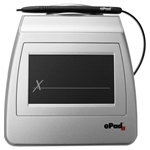 ePadLink ePad-ink electronic signature pad, the most widely-deployed digital signature pad, is used worldwide to capture electronic signatures, whether the signature capture takes place in-branch or in-field. ePadLink ePad Vision signature pad is latest addition to ePadLink ePad Family. 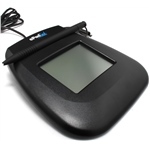 It not only captures secure, legally-binding e-signatures, its large, full-color LCD screen enables you to display unique visual images and text that attract attention and improve cross-selling. ePadLink ePad LS electronic signature pad is a full-color LCD, multi-functional digital signature pad ideal for customer-facing applications where full disclosure, data capture, and cross-selling is important. Replacement stylus for LCD signature pads. Pack of 3. Replacement stylus for LCD signature pads: VP9805, VP9808 and VP9980. Pack of 3. Screen protectors for ePad Ink (VP9805) and ePad ID Pro. Pack of 5. Screen protector for the ePad LS. Pack of one.